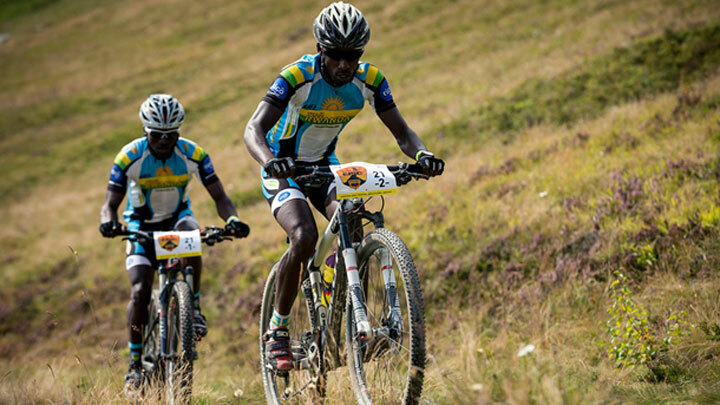 Team Rwanda announced today the roster of cyclists that will represent Rwanda at the 2015 Africa Continental Mountain Bike Championships on home soil. The event will be held on May 8-10 in Musanze. Five elite riders, one under-23 and one junior are set to compete for the Rwanda in the event. The seven-man team will vie for valuable UCI points at the three-day event as Rwanda seek home advantage to boost 2016 Olympics qualification with the maximum number of mountain bike rider slots for the Rio Olympic Games next summer. Nathan Byukusenge and Abraham Ruhumuriza are the only riders who have competed in mountain bike races before.Both raced the Perskindol Swiss Epic in Swistland, last year. This is the second time that Rwanda is hosting a continental cycling event having hosted the 2009 African Cycling Continental Championships for the road cycling discipline. Rudy Hauser and Ueli Gunpli, who work for Trailworks, a trail design and consulting company in Switzerland, have been working hard on constructing the track that will be 6km long on a piece of land next to the Africa Rising Cycling Centre (ARCC), the home of Team Rwanda Cycling (TRC).